CHANGZHOU, China, Oct. 10, 2018 /PRNewswire/ -- Novelis, the global leader in aluminum rolling and recycling, today hosted members of the community, customers and government officials to break ground on the expansion of its automotive aluminum manufacturing facility in Changzhou, China. The $180 million investment will double the facility's production capacity of heat-treated aluminum sheet by 100,000 metric tons in order to better meet the growing demand for automotive aluminum in Asia. The facility will also be equipped with a high-speed slitter, and a fully automated packaging line. The expansion is expected to create approximately 160 jobs. This significant expansion provides Novelis with the additional capacity needed to increase its production of innovative aluminum solutions to enable automotive manufacturers to develop the next-generation of safer, stronger and lighter vehicles. The project is scheduled to be complete in 2020 in order to align with key customer's vehicle-launch plans. The Changzhou facility has a proud history of serving the Asian automotive market and will continue to partner with customers to launch their high performance aluminum intensive vehicles in Asia. Previous partner launches include the Cadillac CT6, CJLR's Jaguar XFL and XEL, and the premium new-energy vehicle (NEV) NIO's ES8 SUV, FAW-Volkswagen Audi A6L and HMC's IONIQ and Kona electric vehicle models, to name a few. In recognition of its quality products and outstanding customer service, Novelis received the honorable distinction of "Excellent Supplier" by FAW-Volkswagen in 2014 and 2015, and was awarded the equally impressive "Strategy Cooperation" award in 2016 and 2017 by Chery Jaguar Land Rover. "As market demand for lighter, more fuel-efficient vehicles continues to grow, Novelis will play a critical role in supporting the next generation of automotive innovation and design," said Satish Pai, Managing Director of Hindalco Industries, the parent company of Novelis Inc. He added, "This expansion reinforces our steadfast commitment to our customers and communities, and reaffirms our continued confidence in this ever-growing market." According to Ducker Worldwide, automakers are expected to increase the adoption of high-strength, lightweight aluminum over the next decade, specifically in light trucks, SUVs and electric vehicles, which will grow at a faster rate than the overall sedan markets in North America, Europe and China. In line with the global lightweighting trend, Novelis forecasts the Chinese automotive aluminum market is expected to achieve double-digit growth for the next decade as a result of government policies to lower carbon emissions and increased adoption of electric vehicles. 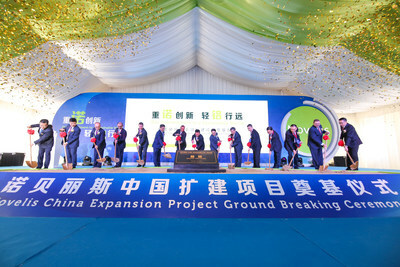 "This investment in Changzhou will allow us to better serve our automotive customers by providing world-class manufacturing capabilities, products that meet global quality standards, and innovative solutions to make vehicles lighter, safer and stronger," said James Liu, Managing Director of Novelis China and Vice President of Novelis' Automotive Business in Asia. He stressed, "We will continue to work alongside our customers from program development to launch, to create new products and processes to meet the industry's evolving needs and enable the future of mobility." Novelis' Changzhou plant is the company's first aluminum automotive sheet manufacturing facility in China. The wholly owned $100 million plant first began commissioning in 2014 with an annual capacity of 100,000 metric tons. Located in the heart of the Changzhou National Hi-Tech District, the plant provides customers in China and abroad with high-quality automotive sheet for use in lightweight vehicle structures and body panels with heat treatment and finishing capabilities.